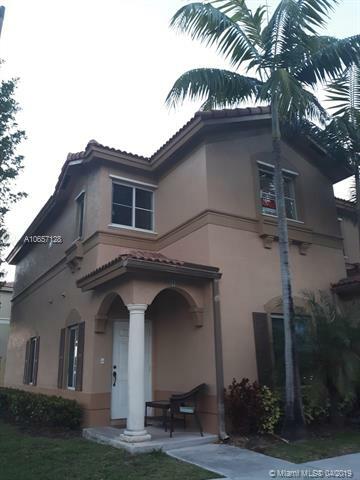 UNAPPROVED SHORT SALE...BEAUTIFUL 4 BED/3 BATH TOWNHOME IN LEEWARD AT ISLANDS AT DORAL. THIS HOME FEATURES ONE BEDROOM DOWNSTAIRS WITH A FULL BATH. TOTALLY RENOVATED AND SPACIOUS ITALIAN KITCHEN WITH GRANITE COUNTERTOPS AND UPDATED APPLIANCES INCLUDING A WINE COOLER. THE BATHROOMS WERE ALSO VERY TASTEFULLY UPGRADED. THERE IS DARK LAMINATED FLOORING UPSTAIRS AND TILE DOWNSTAIRS. THE PAVED, FENCED PATIO INCLUDES A SHED FOR EXTRA STORAGE. THIS HOME IS LOCATED WITHIN A VERY FAMILY-ORIENTED COMMUNITY WITH GRADE A SCHOOLS. IT IS IN AN EXCELLENT LOCATION AND HAS EASY ACCESS TO MAYOR HIGHWAYS, SHOPPING AND GREAT RESTAURANTS. THE BEAUTIFUL AMENITIES INCLUDE A CLUBHOUSE, POOLS, A GYM AND MUCH MORE. GREAT INVESTMENT!